to complete an ER Preliminary Assessment. for proposed development activities, planning and land management projects. for DNR staff and those seeking NHI license agreements. by becoming a Certified ER Reviewer. 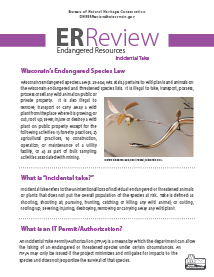 The department can allow incidental take of endangered or threatened species under certain circumstances through an Incidental Take Permit (used by non-state agencies and individuals) or an Incidental Take Authorization (used by state agencies). take, read this flyer [PDF]. If you’ve received an ER Review and need to apply for the allowance of incidental take, please complete the Incidental Take Permit/Authorization Application. A Broad Incidental Take Permit/Authorization (BITP/A) can be created for specific scenarios so that neither an application nor a permit fee are required (although minimization, mitigation and/or reporting may still be required). List of available permits/authorizations below.